Diamond Blades are found in hundreds of different varieties, types, bond types, and manufacturing methods. Ultra Thin & High Precision Diamond Blades are used in Slicing, Dicing, Wafering, Cut-off, Singulation, Grooving, Slotting, Cross Sectioning, Sample Preparation, Gang Sawing, Slabbing, Rough Cutting applications. 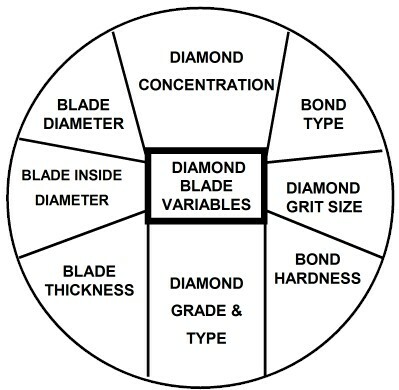 Its important for the user to understand the subtle differences between diamond blade types, their intended application and their affect on performance. The Guide below was designed to aid diamond blade users of all experience levels from novice to experienced manufacturing engineer, researcher and professional craftsmen. Better understand the numerous variables that play a vital role in the success of your diamond sawing operation. Each diamond blade is designed specific application, and hence may react differently under different conditions. What worked for one application, may not work for another. After reading this guide, the user will be equipped with the knowledge to make a more intelligent diamond blade selection. And Select the Right Diamond Blade for their material/application the First Time. concentration) make up the structure of the diamond blade, along with its matrix, (metal or nickel bond). The size of the diamond particle will have a direct result in the size of chip you can obtain. The thickness of the diamond blade (diamond particle plus matrix) will determine the width of the cut. Therefore, diamond blade selection along with feed rate, cutting speed, and depth of cut will ultimately determine your diamond sawing success. SMART CUT is an advanced technology that redefines the standard in cutting and drilling. Diamonds are oriented inside matrix, so that every diamond is better able to participate in cutting action. SMART CUT™ open bond bond design makes sure every diamond is in the right place and at the right time, working where you need it most. You get maximum use of diamond and bond. Find out more.. This process utilizes a rotating circular, toothed blade to cut off the material much as a workshop table or radial saw cuts wood. The ring shaped blade operates under high tension and is held by a precision chick. The cuts made with this method are precise wit little material loss and a good surface finish. Dicing (or diamond-wheel sawing) is used in the micro-electronics industry for fine, accurate, partial and cut-through of exotic, very hard and brittle materials into small squares, or die. Diamond wheel dicing is the most common technique in the industry because of the superior cut quality. It is possible to keep the cut width, depth, straightness, and edge quality within tight tolerances. The first stage of sample preparation, metallography, and failure analysis process. A failed part or piece of material is cut off to be studies and observed in order to identify the origin and reason of part/material failure. The main objective is to cause as minimum material deformation as possible and not alter material structure while cutting. Another important consideration is to minimize additional steps required for sample preparation process. Depending on the type of failure, it may be necessary to take several specimens from the area of failure and from adjacent areas. A principal advantage of gang saws is realized when cutting very hard materials. When extremely slow feed rates are necessary, an entire substrate can be cut in just one or two passes with a gang saw. Thus, high-speed production is feasible, and extreme accuracy can be realized. For sawing applications, gang arbors are available to very precise tolerances, maintaining slot widths within ±0.0002 in ( ±5.08 mm), with a gang pitch tolerance of 0.0002 in, non-cumulative. The best solution for advanced material and non ferrous material high volume production operations. Unlike wafer dicing saws that were designed for more thinner substrate materials. The capabilities of a diamond gang saw are almost limitless. Gang saws have been proven to provide high production volume at minimum cost. Multi-Diamond Blade cutting system makes all cuts simultaneously and automatically separates end cuts from finished pieces. Gang saws are capable of cutting tubes, rods, and flat glass, quartz, carbon, ceramics, plastics, fiber glass, hybrid and exotic materials and most metals. Normal length tolerance is +/- .002". Squareness is +/- 1.0 degrees. Offering Speed, Precision, & Cost Savings. Designed for machining materials such as Glass, Quartz, Ceramics, and Metals. Cut 10 times faster over conventional sawing methods. Gang saws can cut 400 to 6,000 parts per minute 40/1000 to 59 parts in length, Precision Tolerances + 1/200. This process utilizes a flexible, toothed blade is welded into an endless band that rides on wheels driven by two pulleys and is guided through the work cut off or contour. A band saw’s blade is diamond coated by electroplating, a process in which an electrical current deposits the coating onto the blade. This produces a hard, brittle Ni matrix that holds the diamonds in place and permits precise cutting on a variety of materials. A friction saw is a special band saw capable of achieving band velocities of up to 15,000 sfpm or more. Material removal is accomplished in two steps: frictional heat softens the substrate, and the teeth scoop out the molten material. Carbon steel bands are used for flexibility to obtain maximum band life. Method is excellent for cutting extremely hard substrates. Machining operation in which material is removed from the workpiece by means of abrasive points mounted in a matrix in the form of a wheel, stone, belt, paste, compound, or similar application vehicle. Takes various forms: precision surface grinding (creates flat and squared surfaces); cylindrical grinding (process that creates external cylindrical and tapered shapes, fillets, undercuts, etc. ); centerless grinding; chamfering; thread and form grinding; tool and cutter grinding; offhand grinding; lapping and polishing (grinding steps using extremely fine grit to create ultra-smooth surfaces); honing; and disc grinding. Grinding steps take several forms: internal, external, and plunge grinding. 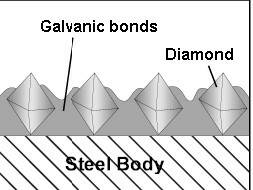 Bond Hardness – Ability of the bond matrix to hold diamonds. As the hardness of the bond is increased, its diamond retention capabilities increase as well. However the trade off is slower cutting speed. Life of the diamond blade is usually increased with hardness of its bond matrix. Bonds are designated on their scale of hardness from Soft, Medium, and Hard. There are dozens of variations and classification schemes based on bond degree of hardness or softness. Using diamond blades with optimum bond hardness for your application is important to successful precision diamond sawing operation. Bond matrix that is too soft for the material being cut will release diamond particles faster than needed, resulting in faster wear and shorter diamond blade life. On other hand bond matrix that is too hard will result in much slower cutting speeds and require constant dressing to expose the next diamond layer. As rule of thumb, harder materials such as sapphire and alumina generally require a softer bond. Whereas softer and more brittle materials require a harder bond. Diamond Grit Size (Mesh Size) – Designates the diamond mesh /grain size used in the diamond blade. This number corresponds to the meshes per lineal inch in the screen used in sorting to size granule particles. Number 120 mesh size would pass through a #100 screen, but not pass through a # 150 screen. According to U.S. Standards, mesh designates the approximate number of sieve meshes per inch. Grit size (mesh size) is generally selected depending on the speed you wish to operate the cut and surface finish of your material. High Mesh Sizes mean fine grits, and low numbers indicate coarse grits. Diamond Mesh Size plays a major role in determining the surface finish quality, smoothness, level of chipping you will obtain, and material microstructure damage you will obtain. Finer mesh size diamonds such as 220 and 320 grit are much smaller in size than coarser diamond particles. And will give you a very smooth surface finish, with minimal amount of chipping on edges. These mesh sizes are usually used for fine cutting of a full rage of materials such as: LiNbO3, YVO4, GaAs, and optical materials. Courser diamond particles such as 80 and 100 grit are much larger in diameter and are frequently used fast cutting / material removal on more harder materials such as silicon carbide, zirconia, Al2O3, stainless steels, and other advanced ceramics and high metallic content materials. Which do not require a very fine surface finish. Diamond Mesh size does have considerable effect on cutting speed. Coarse Diamonds are larger than finer diamonds and will remove more material than finer diamond particles. This means that coarse diamond wheels are more aggressive for material removal than the finer diamond wheels and will cut faster. However, the tradeoff is increase in material micro damage. If you are cutting fragile, more delicate materials then finer mesh size diamond blades are recommended. Diamond mesh size (grit size) should provide maximum removal rate at minimal acceptable finish. Often the desired finish cannot be achieved in a single step/operation. Lapping or polishing may be necessary to produce desired surface finish, as a secondary step in your diamond sawing operation / process. FINE DIAMOND MESH SIZE – 240-400 is used for extremely smooth cutting, grinding and polishing. If the letters S is included, it designates a mixture of diamond sizes is used in bond. By using a mixture of a coarse and fine diamond mesh sizes. The customer may be able to obtain benefit of fast cutting while maintaining a chip free, smooth cut. Diamond Concentration will play a major role in determining the life and cutting speed of your High Precision Diamond Blade. Higher diamond concentration is recommended and usually used for cutting softer and more abrasive types of materials. However, the trade off is significantly slower cutting speed. Low diamond concentration is recommended and widely used for cutting ultra hard and brittle materials. 100 – for extremely hard dense materials and where smoothness of cut and close tolerances must be met. Today, most Production and R & D facilities use low concentration diamond blades for cutting ceramics, glasses, silicon, carbides, sapphire, and other related semiconductor and optical materials. And use high concentration diamond blades on metals such as stainless steel, aluminum, titanium, pc boards. A new technological breakthrough called SMART CUT™ technology, is making fundamental changes in these beliefs and setting new benchmarks on how diamond blade performance is measured. SMART CUT technology allows the orientation of diamonds inside the metal matrix, so that every diamond is better able to participate in cutting action, By orienting diamonds, SMART CUT™ technology makes diamond concentration only a minor factor in the overall precision diamond equation. Studies and extensive testing shows that diamond concentration in diamond blades manufactured utilizing SMART CUT™ technology plays a no major role in determining overall diamond blade performance. 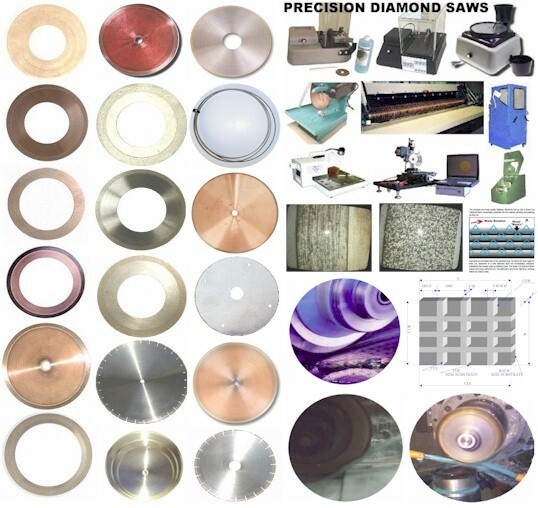 Large number of diamonds in a high concentration diamond blade come in contact with material, creating friction, hence considerably slowing down material removal rate. It takes considerable dressing in order to rexpose the next diamond layer. 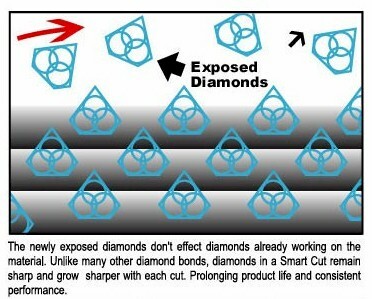 SMART CUT™ technology resolves this problem by making sure that every diamond is in the right place and at the right time, working where you need it most. You get maximum use of diamond and bond. Before this technology was developed, orienting diamonds inside the blade bond matrix was considered impossible. This was one of the main problems faced by diamond tool manufacturers worldwide. Over the decades there have been numerous attempts to solve the diamond and CBN distribution problem. Unfortunately, none of the attempts have been proven effective. Even today 99.8% diamond blade manufacturers still have no way or technology to evenly control and distribute Diamond or CBN particles inside bond matrix, nor properly position them to maximize their machining efficiency. If you are like most users, you come across dozens of materials everyday. Would it be nice to have a diamond blade that does an excellent job on most of these materials? Now you can. Sintered (Metal bonded) diamond blades diamonds sintered and multiple layers of diamonds impregnated inside the metal matrix. Diamonds are furnaces sintered in a matrix made of iron, cobalt, nickel, bronze, copper, tungsten, alloys of these powders or other metals in various combinations. Metal Bonded Diamond Tools are “impregnated” with diamonds. The compacted materials are then hot pressed or sintered to full density. Heating rate, applied pressure, sintering temperature and holding time, are all controlled according to the matrix composition. This means that selected diamonds are mixed and sintered with specific metal alloys to achieve the best cutting performance possible on any materials such as sapphire, advanced ceramics, optics, glass, granite, tile and etc. The metal bond surrounding the diamonds must wear away to continuously keep re-exposing the diamonds for the diamond tool to continue cutting. Sintered (metal bonded) diamond tools are recommended for machining hard materials from 45 to 75 on Rockwell Scale (5 to 9.5 on mohs scale of hardness). As a general rule of thumb, Metal Bond (sintered) diamond blades longer than other diamond bond blades such as resin bond and electroplated (nickel bond) blades. They wear evenly, and are known for their long life & consistency. Sintered (metal bonded) diamond blades are the latest technology available in Diamond Blades. And represent the best value and performance per cut. The letter M designates metal as the type bonding used. Through research in metal powder metallurgy, metal bond has become the most universal bonding material for diamond products. No other bonding utilizes so well the extreme durability of diamonds as an abrasive. It is possible to vary and control the toughness of metal to a great degree while maintaining maximum blade life. 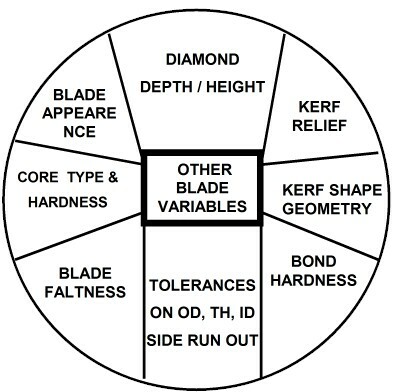 This is perhaps the most important factor in selecting the right diamond blade specification for your application/material. The proper metal bond will hold the diamond particles to their full cutting capability, after which they will be released so that new diamonds can take their place. Diamond blades must have a wear factor. The proper wear factor will provide maximum blade life while remaining sharp, fast and smooth cutting. The bond grading indicates the relative strength or holding powder of the bond. Resin Bond Diamond Blades last less than Sintered (Metal Bond) diamond blades, but more than electroplated (nickel bond) diamond blades. Resin Bond is the softest of all the bonds, frequently used in applications that require a smooth surface finish and minimum amount of chipping. Made from a tough polymer (phenolic) resin formed to hold the diamond particles in the bond. A resin bond is really tar in a solid form. A resin bond must remain very fragile in order to expose new diamonds. For this reason, strong and high quality diamonds cannot be used in a resin bond. High quality diamonds are harder than a resin bond matrix, and would soon disintegrate the bond that keeps them in place. The diamonds that are used in a resin bond are poor to medium quality. Most of them disintegrate or fall out of the bond, before they have a chance of being used. This brings about the need for frequent blade dressing, causing the cut to loose its roundness or form. Another disadvantage of Resin bond is its high wear rate, lack of stiffness, and thickness limitation. Thinnest blades that can be produced in resin bond is .004". A more durable bond is sintered (metal bond). Electroplated Diamond Blades have a high diamond concentration and give a freer, faster cutting action with minimum heat generation. Diamonds stay on the surface of the cut allowing for fast material removal. Electroplated Diamond Blades last less than metal bond, resin bond, hybrid bond blades and are the least expensive diamond blades available. Perfect for smaller jobs and beginning cutting operations. Just about the only type of diamond blade that may be used dry (without coolant) in a few applications, excellent for cutting very soft, ductile, & gummy materials. Electroplated diamond blades are frequently used for dry cutting (when coolant cannot be used). Electroplated blades a particularly well suited for cutting thermosetting plastics, GRP, pre-sintered and pre-fired (green) materials, electro carbons, graphite, silicon, soft ferrites, farinaceous products, deep frozen fish, pones, pc boards, and etc. Varying with application, an average electroplated diamond blade will last you 80 to 120 cuts. Whereas a conventional metal bond (sintered) diamond blade should last you about 1,200 cuts. And a diamond blade with SMART CUT technology has shown to last more than 2,000 cuts. Once you compare price and performance per cut, SMART CUT metal bond diamond blades are the best alternative. Electroplated Diamond Blades cost less, and at first glance may seem like the most cost effective alternative. However, they will cost you more in the long run. Depending on material and application, metal bonded diamond blades will last significantly more than 20 electroplated diamond put together. You can't get more life out of any other blade. Instead of constantly putting diamond blades on and off your saw, you will save time and money by using one blade. This means cost per cut, metal bond diamond blades are the best choice. Electroplated Blades have only one layer of diamond coated on metal core. Diamonds sit only on the surface. When this diamond portion is peeled off, the diamond blade will slow down, cut on the side (not cut straight) or stop working (cutting) altogether. Metal bonded diamond blades have diamonds sintered and multiple layers of diamonds impregnated inside the metal matrix. Unlike electroplated blades, metal bond diamond blades wear evenly, and are known for their consistency. You will get consistent cutting speed, and overall consistent performance from sintered (metal bonded) diamond blades. Diamond Cut Off blade with relief. This blade has steel core. Core thickness is thinner than diamond section thickness. This is the most common diamond blade used in most diamond cut off operations, across wide variety of industries. Diamond Blade that is solid diamond (fully impregnated with diamond from OD to ID of the blade. These blades are typically used for most dicing operations of semiconductor packages, ceramics, optics, and other materials. Diamond Blade that has no relief. Diamond section and core thickness is the same of the blade. These blades are typically used for many gang saw applications of hard brittle materials, glass, optics, and composites. Between METAL BOND and RESIN BOND. Designed to replace the conventional resin bond diamond blades. You will find all the advantages of cutting speed and fine finish that you have come to expect in a resin bond, and long life, consistency, aggressiveness, durability, and excellent performance on you look for in a metal bond. Diamond Blades are an excellent alternative to carbide, and other types of blade. Diamond is the hardest material known to man kind. When used on diamond blades/tools, diamond grinds away material on micro (nano) level. Due to its hardness Diamond will work all types of materials from hardness of 40 on Rockwell scale and up. Diamond Blades will machine hardest material, including those materials that other conventional types of abrasives, carbide and high speed steel will not. Diamond Blades will drill materials faster, produce smoothes surface finish quality, provide consistent performance, & yield (cost per part) possible. Diamond hardness, wear resistance and high natural strength are unchallenged among conventional abrasives. Diamond Blades are an excellent alternative to carbide, and other types of drills Unlike carbide, high speed steel, & other types of blades. Diamond Blade works by grinding away material on micro (nano) level. Carbide and other types blades on the other hand cut material with a sharp cutting edge. Many users have found that ONE diamond blade can last up to 50+ carbide blades put together. Is a Diamond Blade the right tool for your application? To find out, give our Engineering Department a call at Phone: (661) 257-2288.